Brian Anderson: I’ve got a great view of a frozen Miller Park from the big bad board room … where all the magic happens. buck75: Brian, what are your recommendations for Spring Training in Phoenix? What are your must-hit spots (besides Maryvale ballpark, of course)? Anderson: Now that Spring Training expansion has moved to the West Valley of Phoenix. I suggest the Glendale or Peoria area. There is a great area called Westgate in Glendale and Peoria is just a few miles North. Staying on that side of town gets you easy access to the Brew Crew, the Rangers, Royals, Dodgers, White Sox, Reds, Indians, Padres, Mariners … and it is as far away as possible from the Cubs (in Mesa). sagunsky: Did you ever play any baseball on a MLB team? Anderson: There are a few Brian Andersons who have played MLB, but I’m not one of them. My baseball career ended in college. I was a catcher on an NAIA powerhouse back in the early ’90s. I’m still eligible to be drafted, but 17 years have gone by and I’m starting to think nobody wants me to play for them anymore. Plan “B” was broadcasting. I started calling games in the Texas League the year after I graduated from college. buck75: Brian, what are the chances Jim Edmonds makes significant contributions to the ballclub this year? Who do you think will see more time, him or Jody Gerut? Anderson: 50-50. It’s going to be tough to return after missing an entire season of facing MLB pitching. But, Gabe Kapler did it very well, and let’s hope Edmonds can do the same. I would just caution everyone to be patient with Jim this Spring. What you see from him at the plate on March 1 might not indicate what he’ll be on April 1. I wish him well. Confident, left-handed bats off the bench are hard to come by. abdinos: As Fans, we feel sad and disappointed when a player we are attached to doesn’t return to the team for whatever reason. People like J.J. Hardy, Mike Cameron, and Jason Kendall will be missed at my house! How do you deal with players leaving? 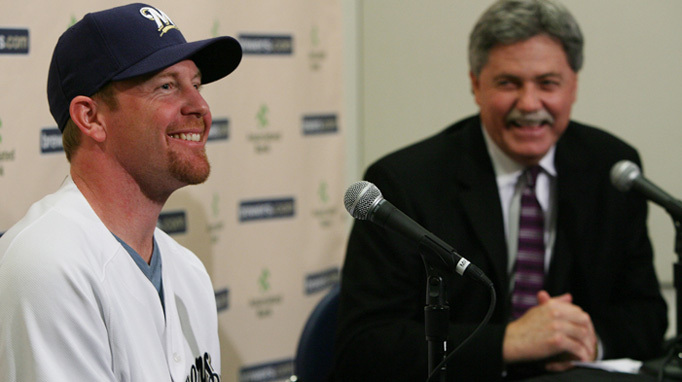 Anderson: Appreciate former Brewers for their contributions and welcome the new Brewers. As a broadcaster, I realize players come and go and know that what matters to the Brewers are the players currently in a Brewers uniform. ran522: What everyday position is the biggest question mark for the Brewers right now? Anderson: Shortstop and third base. Handing the reigns over to rookies at such a key position is always cause for caution. I think Escobar is ready but only time will tell. I’m encouraged by the fact that Alcides had such a great winter ball season in Venezuela. In 45 games, he hit .393, 2 HR, 19 RBIs, 16 SB for Cardinales de Lara. I’m also anxious to see how Casey McGehee follows up on an outstanding rookie year. Now that his knee is healed, I believe you’ll see his true defensive talents … he can pick it at third. dewdeck88: It seems we may have a quality problem heading into Spring Training with Jeff Suppan, Manny Parra, Dave Bush, and Chris Narveson (he pitched great in late ’09) vying for the final two starting rotation spots. Does Bush/Suppan have an edge over Parra? Anderson: That is a quality problem. Depth was an issue last year. Too early to say who has an advantage and I’m not sure Spring Training is going to be the best gauge either. Pitchers like Suppan and Bush use the spring to “work on stuff.” They might not have that luxury this year. Parra has the best pure stuff of the three, but he’s been effective in the bullpen as well (remember ’08 pennant race/playoffs). It’s a decision Ken Macha and Rick Peterson will have to make, and I’m sure they’ll take it to the end of spring. StempDiggity: What are the chances the Brewers will keep Prince Fielder long-term? Have you ever spoken with Fielder yourself about this? What has he said to you? Anderson: That’s the hot potato this year. Doug Melvin has made it clear that negotiations will not occur publicly. Here is what I know: It’s a 3-headed monster. The club, the player/agent, and the union. We’ll see who has the stronger voice. One thing to remember, there are some major impact first basemen hitting the free-agent market the same year as Prince in 2011 (Ryan Howard, Albert Pujols, Adrian Gonzalez). Mark Teixeira is locked in N.Y. long-term, so that knocks out one of the few major cash cow’s. I hope Prince stays. Nobody plays the game harder every day than Prince Fielder. I know he loves Milwaukee, too. StempDiggity: Will Rickie Weeks be able to pick up where he left off both offensively and defensively? I am concerned for both. Anderson: I think so. Rickie is at the point of his career where he can really do some damage. My prediction is that this time next year, people will be wondering what it will take to keep Rickie Weeks in Milwaukee. What a talent! We saw a glimmer of that last year, and I’m confident you’ll see more in 2010 if he can stay healthy. da_pontiff: Yo B to the A. … Would you consider yourself friends with Bill Schroeder outside of work? What about Bob Uecker? If so, who dominates the conversation? I bet its Schroeder. Anderson: Yes, for sure. Believe it or not, I’m not a big talker off the air. When I’m around Uke and Rock, it’s shut up and listen. I wish everyone had the chance to sit on that bus at 4 p.m. heading to the ballpark. A front-row seat to Uke’s pure comedy and Rock’s pure grousing. Best part of the day! We’re lucky to be in the Bob Uecker era, and I think Rock breaks down a game as well as anyone in the business. ddysart: BA, how has your job changed over the years? Specifically with the rise of fan interaction through social media and the “text the booth” stuff. Anderson: My first year on the air was also the first year I had an e-mail address. The social networking has really picked up in the last decade. I think it’s great. What people used to say in their living rooms can be read anywhere. Some folks can be pretty harsh, but overall it’s a great tool to connect with the audience. dewdeck88: Brian, when can we expect Brian Anderson bobblehead day at Miller Park? Anderson: No chance. I try to live my life with a simple motto: “It’s not about me.” That applies to bobbleheads! StempDiggity: What is your true opinion of Milwaukee and Wisconsin since you have come here? Aside from the job, do you like it? Anderson: I love it here. I’m ready for Arizona, though. When the temp is zero and my belly is as white as my rear-end, I know it’s time for some sun! Wisconsin feels like home, now. Great people, great ballpark, I love the crew I work with and hope they’ll have me for a long time. ecocd: With regard to starting in broadcasting, where would you suggest someone start looking for a job? And would you recommend sticking with something you know or any opportunity that presents itself? Anderson: Do whatever you can to get on the air somewhere. I tell young announcers to make sure and get a stable second means of income or else you’ll starve. Listen to your games and keep the faith. Anderson: Thanks for all the questions today. Our hour is up. We’ll do it again soon. Hope to see you all at the On Deck event Sunday or this spring in Arizona.